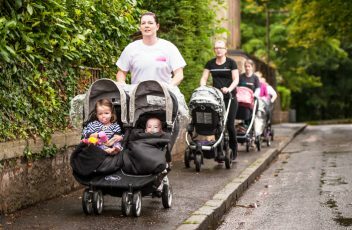 Its not easy to find the time to exercise when one has a busy household and children to look after but walking is one of the best ways to exercise the body without straining the muscles and joints. Lots of mums we have spoken to have abandoned the car for school runs and visits to the shops and parks and taken the kids out in a pushchair. Our T3 range are the ideal models to go for walks with. Large ball bearing wheels and adjustable handles make our pushchairs (see them at www.lotsofbabies.com) one of the easiest to wheel, even with three and four children inside. So leave the car behind and step out for your good health.